After a weary journey at sea, sailors would often stumble through the doors of local pubs and taverns, where they swapped stories and spent their time in good company (with good ale). Many of these pubs also served as inns, where for a small price you could find a place to rest your head – a place that didn’t rock back and forth like an old galley! 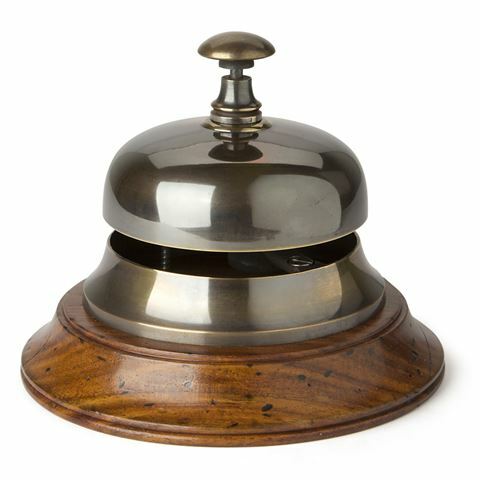 The Sailor’s Inn Desk Bell is colonial in style and cast in bronze, while its carved wooden base adds a sense of contrast. Such a bell would have been found at an inn’s front desk, and would chime out when struck. Place it in your own office or home, and spread a sense of hospitality. Cast from bronze, with a hand-turned wooden base. Press the top of the bell to hear it chime. Dimensions: 11cm (h) x 13cm (w).